In the last few months we’ve seen an increase in 8GByte NAND memory chips with an abnormally high amount of bit errors. 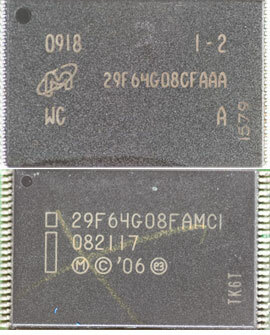 These memory chips are primarily manufactured by Micron and Intel with the model numbers (Micron) 29F64G08CFAAA and (Intel) 29F64G08FAMCI. These NAND chips are primary used in flash devices (SSD Hard Drives, USB Flash Drives, CompactFlash Cards, and Secure Digital (SD) Cards) that are 8GBytes or larger. These NAND chips use 3-Bit MLC which allows NAND manufactures to store more data in each cell at the expense of endurance (reliability). These NAND chips are typically cheaper than their MLC & SLC counterparts which allows for inexpensive, high density (capacity) flash devices. All NAND flash chips develop bit/wear damage (bits randomly change values when read). Sectors in SLC memory typically fail after 100K writes, sectors in MLC memory typically fail after 1K writes, however sectors in 3-Bit MLC memory appear to fail after only 10 writes. Personally I think it’s a bad trade off, when asked our customers say their devices failed within days or months of the original purchase which is confirmed by looking at the manufacture date on the NAND chips. Most of the failed NAND chips were manufactured no longer then 6 months from the date of purchase. Manufactures of flash devices should be required to state the type of memory used whether its SLC, MLC, or 3-Bit MLC. Currently I only see this on SSD hard drives and a few select flash drives. If consumers knew the type of the memory is in their product they may be more incline to purchase flash devices with higher quality memory. Until that happens always assume any flash device 8 GigaBytes and over uses 3-Bit MLC memory. More Information: Micron – SLC, MLC, 3-Bit MLC – What’s the Difference?